Fathers, sons, and sports are enduring themes of American literature. 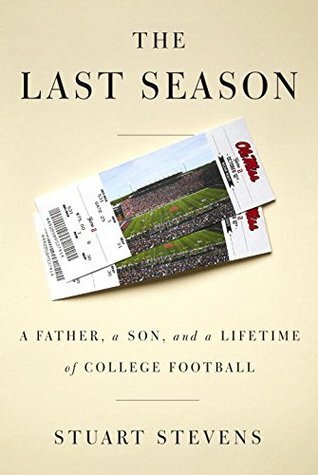 Here, in this fresh and moving account, a son returns to his native South to spend a special autumn with his ninety-five-year-old dad, sharing the unique joys, disappointments, and life lessons of Saturdays with their beloved Ole Miss Rebels. After growing up in Jackson, Stuart Stevens built a successful career as a writer and political consultant. But in the fall of 2012, not long after he turned sixty, the presidential campaign he’d worked on suffered a painful defeat. Grappling with a profound sense of loss and mortality, he began asking himself some tough questions, not least about his relationship with his father. The two of them had spent little time together for decades. He made a resolution: to invite his father to attend a season of Ole Miss football games together, as they’d done when college football provided a way for his father to guide him through childhood—and to make sense of the troubled South of the 1960s. Now, driving to and from the games, and cheering from the stands, they take stock of their lives as father and son, and as individuals, reminding themselves of their unique, complicated, precious bond. Poignant and full of heart, but also irreverent and often hilarious, The Last Season is a powerful story of parents and children and of the importance of taking a backward glance together while you still can. Really wonderful. A memoir that works is a memoir that has magic, some appeal that embraces nostalgia and those special moments that shape people. I'm not a football fan, but it is still a beautiful book for those who are or aren't because the words 'memoir' and 'father-son' bonding over the sport really captures the magic of the game, which even a non-fan could appreciate. This isn't a book about football - it's a book about the bonding of father and son through tradition and indulging in something they share, an everyday occurrence that speaks volumes when introduced into their lives and their relationship. The author looks back with fond memories, comparing the present with his father through the game, finding the love and joy still there. They have changed, they have aged, but the bond if real and true. As I kept reading, I saw it wasn't so much the game but the moment, that special something a person can't put into words, a touching history and connection the game brings to the families who share it. Above football, it captured the bonding of families and fans from all over, recognizing each other at different games, or meeting strangers and binding on this similarity alone, with no awkwardness, no hesitation, just a connection immediately understood. Stuart Stevens, from Mississippi, went through the book with the catchphrase repeated, Hotty Toddy, the spirit of Ole Miss. He dug into the old southern feel and tradition, not leaving out the racism slant that troubled him as he grew up during integration of the school system. Sometimes I thought this was delved on a little too much, almost to the point of dividing the book into two points instead, but it ultimately blends together to bring a lot of pieces into one large picture. "That I had this chance was a pure accident of my birth, being lucky enough to have parents who gave me options. We say that in America anyone can become anything he desires, which is probably more true for us than most countries, but that still doesn't make it true." The author made the transition painless when going from the past to the present, perhaps because they were already so intertwined and connected. Sometimes its tiresome to me to try continuous time shifts but I didn't notice in this book, it was done that well. Stevens writes beautifully, wordy when it should be, to the point and on focus at other times. This isn't a book that will cause a long review, other than to say it was wonderful and beautiful, told through real characters and touching moments. Again, there's magic in memoirs.I received from Penguin Publishing in exchange for an honest review. "But that night in Oxford, first in the soft dusk of a hot Mississippi evening and then in the darkness that seemed to last too long, the rioters didn't want the world to watch; they wanted the world to go away."